After a long string of business failures, Gail Borden in mid-life was left virtually penniless and abandoned by his second wife. His recovery and the magnitude of his ultimate success, however, would inspire any Texan. Born November 9, 1801 in New York state, Borden spent parts of his childhood in New York, Kentucky, and Indiana. In his twenties, he moved to Mississippi and worked as a surveyor before coming to Texas in late 1829. After spending some time farming and raising stock, Borden replaced his brother as official surveyor in Austin's colony, headquartered at San Felipe. He then represented San Felipe at the Convention of 1833. With Joseph Baker and his brother Thomas as partners, Borden launched the Telegraph and Texas Register, a newspaper that would serve as the voice of the government of the Republic of Texas after the revolution. Borden, however, sold his interest in the paper in June of 1837. After serving as collector of customs at the port of Galveston in the early days of the Republic, Borden turned his energies to Galveston real estate. 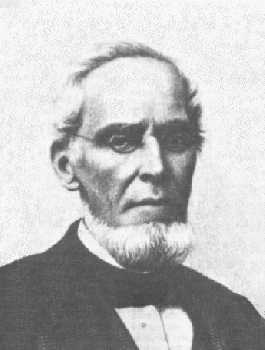 As agent for the Galveston City Company throughout the 1840s, he helped sell 2500 lots that developed the island into the largest city in Texas during the later part of the nineteenth century. It was Borden's inventions that resulted in his greatest failures, and ultimately in his greatest achievement. With assets worth some $100,000 in 1850 (a small fortune for his day), he risked and lost almost everything on his "meat biscuit," a dehydrated meat mixed with flour. He moved to New York to be closer to trade centers and promote the product. After many years of effort, he abandoned the project so that he could spend full time on another of his inventions--a process to condense milk. Successive failures of two milk condensing plants in Connecticut in 1856 and 1857 exhausted his already dwindled reserves. The backing of a New York financier, however, allowed him to continue a few more years. It was not until the outbreak of the Civil War, and the resulting demand for longer lasting condensed milk by the Union army, that Borden's success was finally assured. After the war, a much wealthier Borden returned to Texas. There, he established a meat-packing plant in the town of Borden, which he founded in Colorado County. He also established a sawmill and copperware factory at Bastrop some fifty miles up the Colorado River. In addition to these ventures, he supported a number of schools, churches and other charities. Borden died in Borden, Texas on January 11, 1874. His body was transported to New York for burial. Two years later, Borden County was formed and named in his honor.